DoubleKiller searches for duplicate files by comparing any combination of name, size, modification date and content. You can exclude files or limit the scan to files matching masks like *.mp*g, files in a particular file size range or files with certain attributes, like hidden or system files. 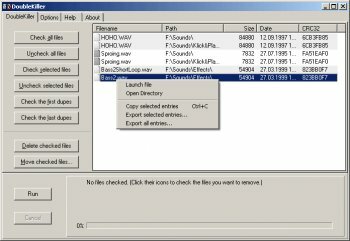 When the scan is finished a list containing all duplicates found is displayed and you can manually or automatically select the files to be removed. The standard version is free for private use.